Are you in school studying museum studies or a related field? Need internship hours? Want hands-on museum experience while living in the beautiful mountains? The museum has unpaid internship opportunities for an assistant to our Curator--cleaning, storing, and caring for the museum's collections. Interest in Western History a must. Internship opportunities in program development and marketing and social media available as well. Please contact our Director, Candice Bannister for an application and phone interview at cbannister@treadofpioneers.org or 970-879-2214. 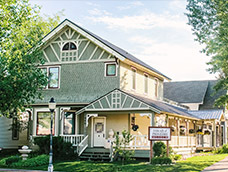 The Tread of Pioneers Museum, Steamboat Springs, CO, and the Colorado Episcopal Service Corps (Colorado ESC) are partnering to hire a Museum Assistant intern for an 11-month term (August 18, 2019 � July 19, 2020) who will serve 35+ hours per week in beautiful Steamboat Springs, CO.
As the Museum Assistant, the intern will contribute to the inner workings of a local history museum by performing various duties to collect, preserve, exhibit, interpret, and share the history and heritage of Steamboat Springs. The intern will primarily assist the museum Curator with various collection duties including: caring for collection items; enhancing exhibits; updating the collection database; and assisting with the photo archive and research projects. The intern will also assist all staff with public educational programming and events, front desk assistance, general administrative tasks, and more. Working as the Museum Assistant, the intern will also serve as a Colorado ESC member. The ideal Colorado ESC candidate will be 21-30 years old and Christian or curious and open to engaging with the Christian faith; though a person of any faith may apply. In exchange for hours of work at the museum, the intern will receive the following from Colorado ESC: a monthly stipend, housing and health insurance. The member will also participate in regular faith formation through the Episcopal Church with their house members. For more information about the Colorado ESC and to apply to serve at the Tread of Pioneers Museum through Colorado ESC, go to: coloradoesc.org. For immediate inquiries about or to express interest in working at the museum, please contact Candice Bannister, Tread of Pioneers Museum Executive Director at (970)-879-2214 or cbannister@treadofpioneers.org.